The best things in life come in threes, or so we'll say for our purposes here. Nvidia is out today with the third member and for now final member of its GeForce GTX 700 series, the GTX 760 GPU. As the company put it during a briefing at E3 2013, making a better PC gaming experience starts with creating faster hardware, and that's where the 760 comes in. Based on Nvidia's Kepler architecture, the 760 is about striking a balance between price and performance, the company told us. Whereas the recently announced GTX 770 and GTX 780 are aimed at pushing the limits of PC performance, the 760 is a more wallet-friendly yet still an adroit alternative. Just how much can you expect to pay for the GTX 760? Try an expected start price of $249 (around £161, AU$268). The GTX 760 may be a cheaper 700, but it's no slouch. The graphics card is loaded with 1,152 CUDA cores and boasts a base clock speed of 980MHz. Boost clock hits 1,033MHz and memory speed runs at 6.0Gbps. Like it's big brothers, the GTX 760 comes in both 2GB and 4GB/256-bit GDDDR5 configurations and has Nvidia's GPU Boost 2.0 tech. Power connectors stick in 6-pin + 6-pin, while users also have access to 2x DL-DVI, HDMI and Displayport 1.2 for output purposes. Finally, single precision processing power flushes on 2.3 Teraflops and thermal design power is 170W. Users shouldn't worry too much about noise from their GTX 760's fan as Nvidia has equipped it with its whir-reducing adaptive temperature controllers. Building on previous GPU generations, the GTX 760 smashes past some older Nvidia chips. 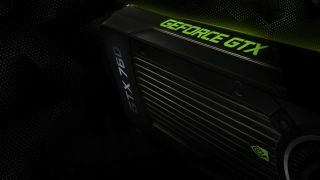 Compared to 2009's GTX 275, the 770 has a 200 percent performance jump, and it's 140 percent improved over the GTX 560, out in 2011. As Nvidia tells it, the GTX 760 is designed to give gamers a heady amount of power for this year's games. Titles like Batman: Arkam Origins, The Witcher 3: Wild Hunt and Watch Dogs are the types of game play it's targeting to optimize with the new GPU. With the addition of the 760, Nvidia flushed out its GeForce GTX 2013 offerings through the rest of the fall, topped by the GTX Titan and anchored by the GTX 650. The GTX 760 will be available worldwide through Nvidia's partner, including Asus, Colorful, EVGA, Galaxy, Gigabyte, MSI and Zotac. U.S. customers can expect to see fully configured systems hit builder shelves at places like AVADirect, Digital Storm, Geekbox, V3 Gaming and Velocity Micro. Way back in May when Nvidia first revealed the $600+ GTX 780, the company also threw light on a game recording feature called ShadowPlay. While we heard plenty on its up-to-20-minute recording capabilities, we were only told that it would be available in the summer. Well, summer is here, and so is ShadowPlay: Nvidia is bringing the feature in beta form to GeForce Experience starting today. ShadowPlay utilizes the video encoders built into Kepler GPUs, allowing users to record what they are doing on the screen with minimal impact on the frame rates (the largest dip Nvidia has seen in its test is 5 percent). What's more, it's always on, so users don't have to anticipate when they want to record; they just can. "We've designed it so you wouldn't just have it on," the company told us at E3. We saw ShadowPlay in action in action at E3 and sure enough, during recoding, dips in frame rate were much smaller compared to Fraps. Depending on the length of time you set in Shadow Mode (between 1 minute to 20 minutes), ShadowPlay will automatically save that clip to a spot on a PC users select beforehand. The files, already compressed, can be uploaded to YouTube/Facebook/etc. as is.